WeVets.us, a unique web/app rating platform for veterans, their family members and patriots, has announced their leadership team. Chad Cadwell serves as President, Cole Peacock serves as Chief Marketing and Operating Officer and Reema Bhatia serves as the Chief Technology Officer. WeVets.us, a unique web/app rating platform for veterans, their family members and patriots, has announced their leadership team. Chad Cadwell serves as President, Cole Peacock serves as Chief Marketing and Operating Officer and Reema Bhatia serves as the Chief Technology Officer. The three form the WeVets leadership team. Chad Cadwell has been appointed President of WeVets. Chad has spent the past 20 years in managing and developing teams in the hospitality, customer service and adventure sports industries. He attained his masters of science from Northern Illinois University, with a focus on Sport and Risk Management, and is the founder of AdventureSome Consulting. He has managed diverse projects including political campaigns and reality TV productions. His adventure sport businesses, Missouri River Expeditions and EartH20 Adventure Outfitters, and the experience he gained from facilitating outdoor and adaptive experiences has laid the groundwork for the pursuit of his passion which is to bring about positive change in the Veteran community. His mission is to apply his boundless energy, leadership skills, knowledge, and experience to see that veterans’ needs are met, and that the quality of their lives is improved. Cole Peacock serves as the Chief Marketing and Operating Officer. Cole is a dynamic industry leader and top tier consultant in both the public and private sectors. He is a past Fortune 500 Executive in the retail space bringing 20 years of rich and broad experience in the areas of Corporate relations, operations, investor relations, national branding projects, communications and governmental relations. At 24, Cole administered political campaigns and became actively involved in community support and charities. Over the course of his career he has raised more than $30 million for various causes. He is the now president of RC Peacock Consulting. In recent years he has been recognized as one of the Gulfshore Business Top 50 Power Players, The Congressional Order of Merit, Leadership Florida, and the Boys and Girls Club Champion of Youth. Early in his career, Cole made the ethical commitment to use his power and influence to benefit the greater good, and that is his continuing mission. Reema Bhatia serves as the Chief Technology Officer for WeVets. Reema is a software designer known for inspired problem solving and expertise in the latest technology. Her company, Stickboy Creative provides custom software solutions and implements strategic technology plans for companies including Aerocare, Larson Education, and Jet’s Pizza. A graduate of NYU with a Master’s of Science, Reema is responsible for all aspects of the technology systems at WeVets.us, and her mission is to ensure maximum performance, accuracy, reliability and availability. Similar to Yelp! for the military and veteran community, WeVets.us has a robust crowdsourced rating component that provides veterans with an active voice in identifying pertinent issues, weeding out fraudulent or ineffective programs, and praising others for jobs well done. 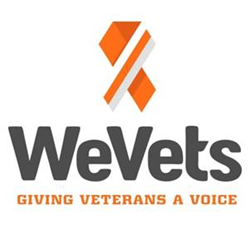 WeVets (http://www.wevets.us) will be used to rate businesses, restaurants, or healthcare providers that honor their promises to those who serve or have served. It is also a platform that will expose the businesses that are not honestly providing the services, discounts and resources they advertise. WeVets.us http://www.wevets.us will be welcoming their first one thousand registrants to a private Beta launch this March 2016.